As of 2015, this area is closed to the public. Any past permission that was granted has been revoked. Certain guides are allowed with specific arrangements. Some guides/outfitters have written agreements, for a fee, which permit them to take students climbing on the ice. This is private property and only open to certain guides! This is a local spot for beginners and those wishing to escape the madness of Vail or Lincoln. Close to the road, it lies, but protected from winds and vehicular noise from US Hwy 24. 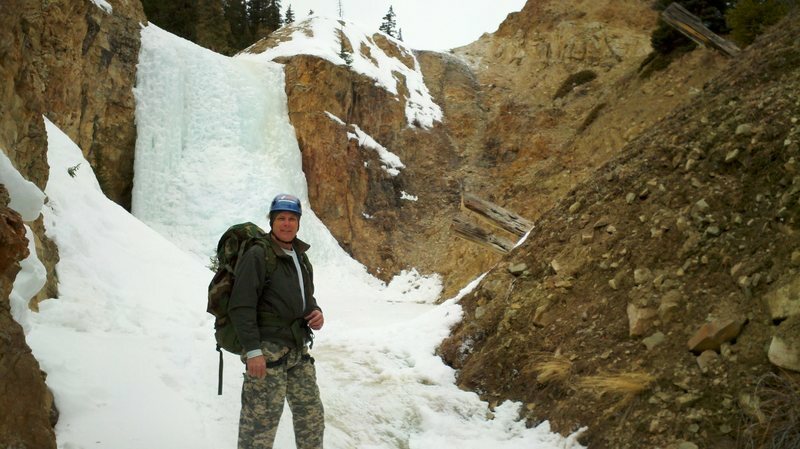 North of Leadville and south of Copper Mountain lies this frozen waterfall on Forest Service land. There is about 40 feet of vertical, and usually only 1 flow. You can usually judge the crowds by the cars parked at this pullout. Note, snowmobilers will use the area, too. In the morning, you can gear up in the sun. In the afternoon, the sun can still be accessed up the slope a bit. The ice forms as a shell of the flowing water underneath. Beware, it can be thin. It can be brittle when cold in the morning, ask Joe. Previous years like 2001-2 have had a curtain form to the left of the flow with some guidance. Scratch marks on the rock to the right and left suggest mixed climbers have played here. The anchors above are two trees, one (10 feet back) of which is quite slender, perhaps 20 feet back from the ice. There are 2 slings and 2 rappel rings on the larger tree. A 50m rope is adequate for climbs here. Lead it or set up a TR with an approach up the gully to the sides. Note, some folks have gotten cliffed by wandering up the wrong line. There are some mixed lines out to the left. This area lies about 100 miles West of Denver. From Leadville, head north on CO 91 towards Copper Mountain. As you approach Climax Mine & Fremont Pass, stop about 3.4 miles short and just past some power lines that cross the road. From Denver, take I-70 to Copper Mt., South on CO 91, pass the Climax Mine/Fremont Pass 3.4 miles. You go through the switchbacks downhill and about 0.1 mile short of power lines crossing overhead. There is a pullout on the W side with the Forest Trail #134 marked for snowmobilers, cross-country skiers, hikers. Head uphill/North on the trail perhaps 100 yards. Look for tracks crossing into the woods at a soft angle to the left. Hike down briefly into the streambed with lots of loose debris (somewhat reminiscent of the Silverplume) and then 200 or 300 yards upstream. The hike is 5-10 minutes at most. Chalk Creek does have avalanche prone slopes. Beware if you are wandering around above. Chalk Creek Ice. Photo: Steph Miller. PLEASE NOTE: The Leadville climb is on Rte. 91 NOT US 24 as the above directions say. From Leadville, go NORTH on CO 91 to the 8 mile marker and the pull out for parking in on the LEFT directly across from the 8 mile marker sign and JUST PAST SOME OVERHEAD HIGH TENSION WIRES.